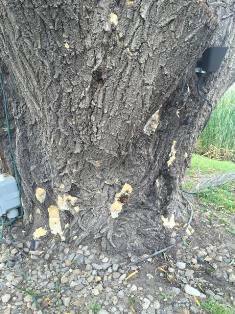 Q: I have a willow tree, which is being attacked by a mushroom fungus. About a year ago I had this problem with the tree and I scrapped off the mushrooms. 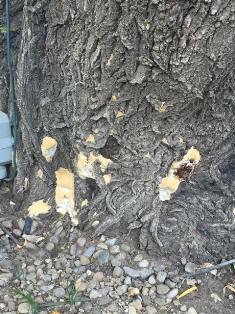 Is there a chemical I can spray to kill off the mushroom that will not harm the willow tree? 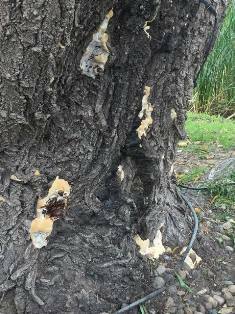 Growths like this are the fruiting bodies of fungi that has infested the truck of the tree. Spraying this growth with a toxic chemical fungicide or with one of the organic ones will kill the part you can see but will have no effect on the infection that is going on inside the trunk. 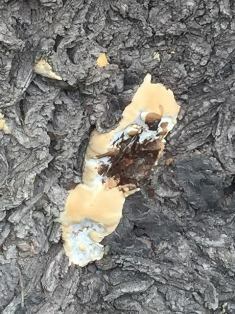 Injecting the fungicides into the trunk will be more effective at killing the disease but unless something is done to correct the cause that invited the pathogen in the first place, it will grow right back, usually with a vengeance. Now I will have to say that willow trees are not long lived and the basic stress on the tree in this case may be just old age. However, this solution is worth a try because the tree appears to be worth the effort and even if it dies, the soil in the area will have been greatly improved for whatever else is planted.